We spent the night in Sinai'a, a town named after Mt Sinai. Despite this religious connotation, Sinai'a is a resort area that nestles in the Bucegi Mountains.. Here, Chris takes us through Pelesh castle, regaling us with tales of valor by old Romanian kings. We hear stories about all of them because only four existed in history; Romania's kingship began in 1859 with the foundation of the state (Vlad the Impaler, Romania's most famous ruler, was only a prince and lived before Romania became an independent nation). The monarchy ended with communism in 1946. Our guide bursts with pride about his country; from his stories you'd believe Romania invented the wheel, rocket, and everything between. He eagerly drives us from one picturesque town, fortress, or monastery to another. 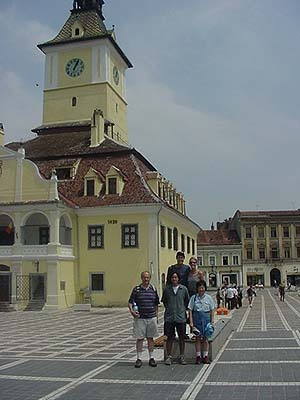 We visiit Prejmer, Brasov, and Sibiu. 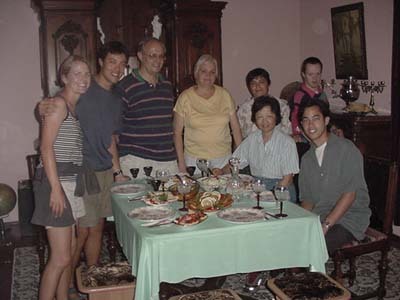 By evening we arrive at Sebes, the village where Ed works for the Peace Corps. We'll live like locals for a night. 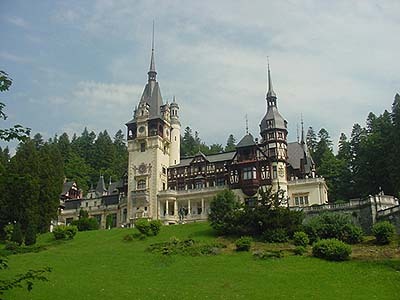 Pelesh castle, built by King Carol I (Romania's second sovereign) in 1870 as a summer residence. Carol I knew interior decoration. He spent his own fortune on lavish furnishings, precious wood carvings over the ceilings and floors, and a few wall-sized, flawless cyrstal mirrors. Piata Sfatului, Brasov's central square, lined by Baroque houses, German churches, and outdoor cafes.. Brasov acts as a hub of the country, centrally located between Romania's three principalities: Moldavia, Wallachia, and Transylvania. 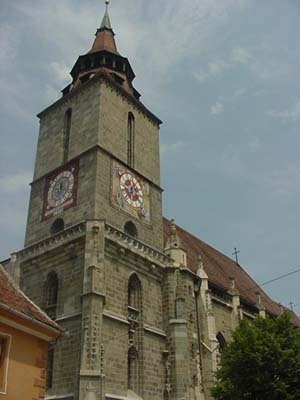 Brasov's Black church, named after soot that covered the walls from a fire in 1689. The church couldn't be named after Africans, because there are no Africans, Asians, Latinos, or any other faraway immigrants living in Romania. 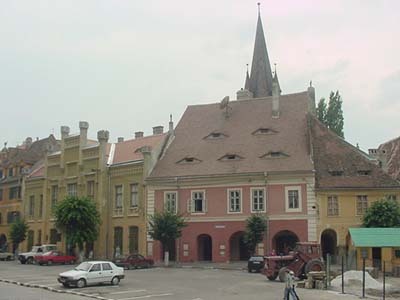 Sleepy eyes on the roofs of Sibiu, one the seven towns founded in Transylvania by the Germans (the others: Sebes, Bistrita, Cluj-Napoca, Medias, Brasov, and Sighisoara). Don't know who introduced 'sleepy eye' windows into Romanian architecture, but the Germans came here to help defend the eastern borders against the Mongols and Turks. In those days Hungarians governed Transylvania, Germans defended it and called this region Siebenburgen (Seven Cities). Where were the Romanians? Peasant farmers downtrodden by a Hungarian elite. It's still a sore point between the Romanians and Hungarians (Hungary claims to have ruled Transylvania for centuries and wants it back, Romania claims the Hungarians were oppressive invaders). Ed's two families. Miss Buta, the lady in yellow, is Ed's host and boss. She served a delicious meal of fried pumpkin, chicken, eggplant dip, homemade wine, and a glass of the local moonshine.